Can’t believe I’ve left it three days to post these, clearly I’m not as organised as I thought I was! This is the last batch of festival stories, because I’m off to start New Job tomorrow. There may be the odd one or two events still trickling onto the blog, but nothing major. I was only at one book festival event on Thursday, but it was a good one. Stephen McGinty and Daniel Pick’s talk entitled ‘In Pursuit of the Nazi Mind’ turned out to be more subtle, and more interesting, in its subject than the initial description suggested. Their books talk about the attempts that psychologists and psychoanalysts made to understand Rudolf Hess (Stephen McGinty’s book) and Nazis in general (Daniel Pick’s book). So we have the history of psychology as well as the history of the war. The Rudolf Hess story sounds fascinating – the book focuses on the year that he was held in an English country house (apparently John Humphreys described it as ‘Upstairs Downstairs with Nazis’) with the psychologists trying to convert him to their point of view rather than interrogate him. Daniel Pick spoke about the changing views of historians about whether a psychoanalytical approach to their subjects is appropriate. Two more books to go on my reading list! And their authors gave great, straightforward accounts of them. I saw four dance pieces at DanceBase, but they are grouped into two shows – typically, the two I liked were in different programmes! MEITHEAL is the one I would really highly recommend. All are in the main theatre at DanceBase, and having been really rude about Studio 3 the other day, I have to say the theatre is one of the most pleasant and comfortable venues I’ve been to. Some quick comments on the dance pieces.. Fruitful Ties by Steinvor Palsson and Matthew Hawkins and Bone Dust by Lucy Suggate made up the first programme. Fruitful Ties had the best costumes I’ve seen so far – they were actually made of ties! And there was something with lemons, so the title is very literal. Interesting to watch, and beautiful at times, but I didn’t entirely understand what they were on about. It was one of those events where I felt that other people were getting a lot more out of it than I was. Bone Dust was a surprisingly thoughtful piece, given that its subject matter is the slightly surreal ‘how will I dance when I’m dead?’ I particularly liked the first section, where is appears that the dancer’s limbs are disembodied – very effective. Then she appeared in a skeleton mask and I realised how much we always picture Death as male – seeing a skeletal head with a female body was a little disconcerting. There was a great wee monologue from the dancer about the choreography and a lovely, disconnected, loose-limbed dance with video piece. Really my one criticism was that it was pretty short – I’d have liked something more extended. The second programme was MEITHEAL by MAX.IMEALLDANCE and Worst Case Scenario by Taciturn. MEITHEAL was probably the strongest dance piece I’ve seen in this festival. It’s about manual work and community, and the dancers are described in the programme as ‘cogs in an efficient machine’. But what I really loved was that they make a beautiful, graceful machine, not the stereotyped robotic movements that most people ‘dancing like machinery’ would come up with! They look like a really gorgeous steam engine or something, something that you can really admire for how well it fits together. The piece was gloriously physical and made fabulous use of light. And I loved as well that the dancers were so connected with each other and the audience: again, they didn’t put on robot faces. The whole piece was gorgeous. Worst Case Scenario was one of these pieces that makes me think ‘I can see why other people are liking it, but it’s just not my thing’. It’s a humorous piece about our worst fears, and it’s well done, but the whole silent-movie slightly slapsticky humour doesn’t really do it for me. The use of voice-overs and sound in general is good, and the dance is good, but just not at all what I like. Note: I was given free tickets for all these events through Clicket. I will be blogging very little else for the remaining days of the festival, so do keep up with my fellow bloggers on the Clicket blog! And a special book festival it is too! I am having a brilliant time. Lovely atmosphere. I’m a bit behind with blogging so let’s have a quick catch-up of the last couple of days (not in order. Maybe in order of my enthusiasm). Alice Oswald‘s recital of her long poem ‘Memorial‘ was probably the most memorable poetry event I’ve ever been to. She recited from memory for one-and-a-quarter hours without moving at all (except her left foot tapping along with the rhythm). This incredibly focused recital seemed ideally suited both to the origins of the piece (it’s based on the Iliad) and the content (how 200 ordinary soldiers died). Better critics that I have reviewed the work extensively – I’d recommend you go and find them – but I found the precision and personal detail very moving (the stabbed soldier who ‘bit down on the spear tip’, the ones who had just got married, the ones who asked for mercy and were denied). Really, it could be any soldiers – the fact they are from thousands of years ago is irrelevant. If you ever, ever get the chance to see this it is unmissable. Nick Coleman‘s event was also totally engaging though in a very different way. He was telling the story (as his does in his book) of his sudden neurosensory hearing loss, its massive impact on his life (particularly as he’s a music journalist and arts critic) and the subsequent recovery process. I just loved how well he could describe the experience of having tinnitus – I guess his music writing experience was the ideal background for being able to describe all the weird sounds. After his hearing loss, he couldn’t get anything out of music at all, but was advised by Oliver Sacks that ‘the only way to be able to hear music is to be able to remember music’ – the brain activity is the same. So in the book he writes about the music he loved and how he came to love it. I think I’d be more interested in the neurological bits of the books than the music bits but he was a marvellous speaker with a tremendous story. It was a shame there was no time for questions, because I’m sure there would be people in the audience with common experiences to share. James Geary and Sam Leith‘s talk was called ‘Unleashing the Persuaders’ and it was about the techniques of persuasion through metaphor and rhetoric. I loved this. They were really funny, and amusingly bitchy about bad writing, but mostly I loved that I learnt a lot in the talk. Who knew that you use 5-6 metaphors a minute in normal speech? I keep spotting them now! In poetry, we know that words that seem similar can have different connotations and that’s the same with metaphors too – they trigger particular associations. I really enjoyed Sam’s dissection of Barack Obama’s inaugural speech and the American traditions it was plugging into, and his discussion of how politicians try to make their answers seem inevitable. And James’s explanation of aphorisms while juggling was certainly a highlight. I definitely want to read both their books – I is an Other and You Talkin’ to Me. Paddy Ashdown is doing more than one book festival talk, but the one I went to was about his book on the Cockleshell Heroes – the 1942 canoe raid on Bordeaux (there’s a decent short account of it on the BBC site here). I loved his enthusiasm for writing – “I absolutely adore the process of writing a book” – although I wished he’d read slightly shorter extracts and just chatted more. He’d found out some really interesting stuff in the archives – particularly the German archives which showed pictures of the (limited) bomb damage done on the raid. Also his own experience in the Special Boat Service gives him a personal connection to what these people did. The book has got to be a good Christmas option for that hard-to-buy-for uncle! Jon Grey and Jamie Keenan had loads of fascinating information to impart about book cover design, and I loved how they illustrated the talk with their own cover designs – even the ones that had been rejected! However, presenting all twenty of their ‘immutable theories of book cover designs’ in an hour is always going to be challenging timewise and I found their presentation frustrating, particularly when they sped up at the end. I’d rather have seen 5 or 6 theories discussed in a leisurely manner with time for questions, or all twenty presented in a well-rehearsed, focused way with single examples. And their reading off clipboards made it a bit primary-school-play. A shame because the content was brilliant – I’m amazed at how many of their covers I recognised and loved, and each individual theory was really interesting. 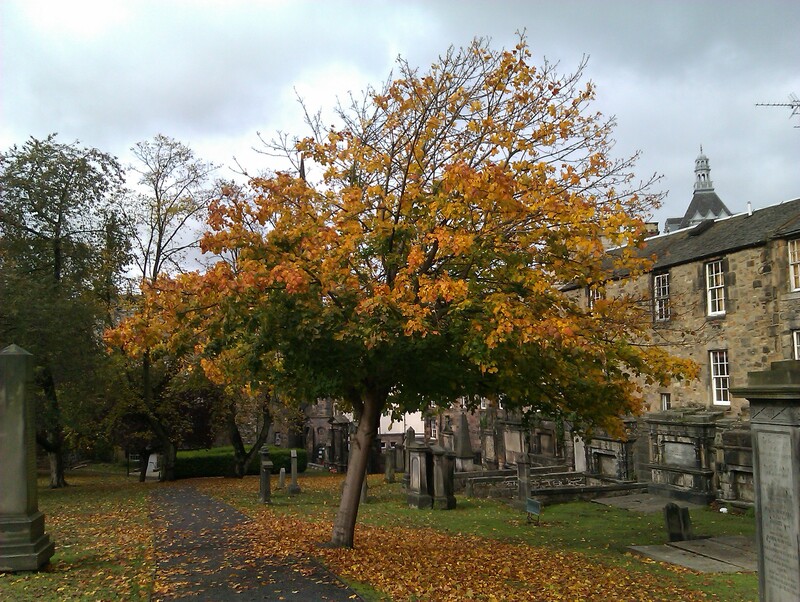 I’m back out blogging for Clicket today – book fest and DanceBase. This is my last proper day going to the festivals so I’d better make the most of it! Note: I received free tickets through Clicket for all of these events except Alice Oswald. AL Kennedy‘s talk at the book festival was an easy sell to me. In fact, it’s one of the very few events that I bought a ticket to on the first day they were released because I knew I would be absolutely kicking myself if I missed it. I’d already read some of her pieces about writing, which I found funny and humane (there are some in the Guardian, and on her website under the ‘For Writers’ section – although either my memory is bad, or there is less there than there used to be). She’s very good on the actual day-to-day business of being a writer, and having to live with the inside of your head a lot (“it’s not good for you to sit in a room and be in charge of a world”). This was exemplified in the very funny piece she read about being out in a writer’s cabin in New York State, plagued by woodpeckers. What I didn’t know is that she has a book on writing coming out next year! So I am massively excited about that. The interviewer for this was Sue MacGregor which made it even better – both of them are people I could listen to all day, so an hour was far too short. I find AL Kennedy really inspiring because she seems so uncompromising in a good way – like she understands herself very well, and just makes things work for herself, even if other people might think she’s weird. Something to aspire to I think. Marianne Wheelaghan has a much more extensive account of this talk on her blog today – I recommend it. 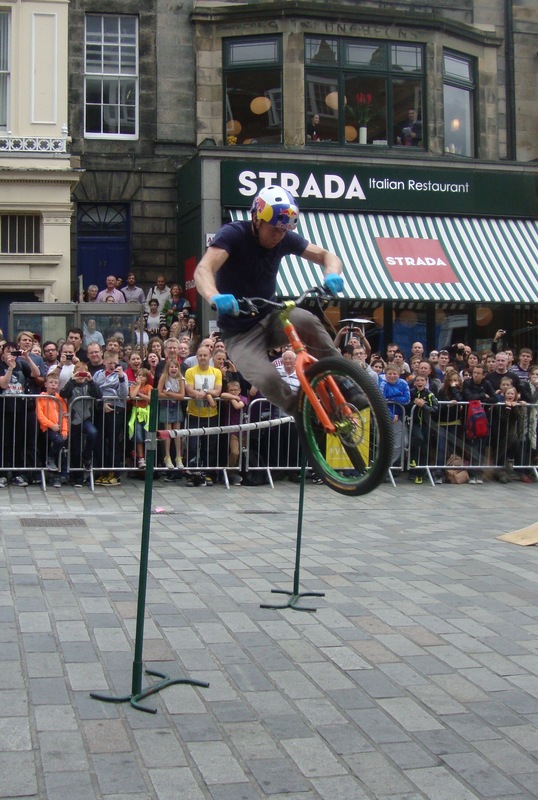 In Clicket-y business, I went to see Danny MacAskill do ridiculous and incredible bike tricks on Castle St. This was part of the art festival. I was a little sceptical of the link, but I have to say his work was beautiful and it definitely got an audience that wasn’t your typical art festival crowd – great outreach. Personally, I get a wee bit irritated with the ‘ooh, will he make it, will he not’ build-up to stuff that he’s clearly done a million times but it definitely worked with the kids in the crowd and some of the tricks were just extraordinary – glad I saw them! – turning up at Story Shop at the book festival (4pm every day, free, highly recommended) for Martin Macauley’s marvellous and rather bleak story (which you can read here): I will never look at gulls in the same way again! – and finally, a 6 hour marathon of spoken word at Blind Poetics. Which… well, there were lots of good performance poets but I don’t think I should read at midnight (which actually because 1am) ever again. I am too old and my body won’t take it and decided to give me evil insomnia, so I’m kind of broken today. But at least I did it once! My first event of the book festival last night! I love the book festival – such a massive programme right on our doorstep (though I was also lucky where I lived before, which was midway between Hay-on-Wye and Cheltenham). The talk was entitled ‘The Sinking of One Man’s Reputation‘ but I guess the title of the book itself ‘How to Survive the Titanic‘ is more of a headline grabber. Frances Wilson has written a biography of the chairman of the White Star Line, J. Bruce Ismay, who escaped the Titanic in one of the last lifeboats and was vilified for it afterwards. The historical setting was really interesting – it’s amazing that people keep coming up with new angles on the Titanic story. Ismay himself never wrote about the Titanic, unlike many of the other survivors. And the US inquest seemed likely to blame him for the entire accident as he told the captain not to slow down when they knew they were getting near to the iceberg (in the end, it decided that he was not ‘responsible’ but may have had an ‘unconscious’ influence over the captain). Wilson’s approach is to concentrate on that moment that he stepped into the lifeboat and go into all the things that may have influenced his decision. I had nitpicky objections to a number of these as described in the talk – posthumous medical diagnoses by a non-psychiatrist being one of my particular pet peeves. Also there seemed to be an attempt to garner sympathy (“He had fallen in love for the first time!” “He was socially excluded at boarding school!” and, most weird of all “He was 49! That’s an important age for a man!”) These didn’t sit well – you probably could have made similar comments about any of the 1500 who died. Everyone had something to live for. I enjoyed a particularly thoughtful round of audience questions and comments, including from Ismay’s great-grandson. I’d definitely be interested to read the book, to get more of the nuances of the story. It’s amazing how the Titanic still fascinates us as a culture, and this certainly adds one more perspective. Upcoming: today I’m excited to see A.L.Kennedy, my writery friend Martin Macauley is reading today’s Story Shop story at 4pm in the book festival Spiegeltent (come along! It’s free!) and I’m off to a mega Blind Poetics tonight before hitting the book festival again tomorrow for Clicket. Probably no blog till Wednesday. You’ve got to love the concept of a ‘Tourist in Residence’. 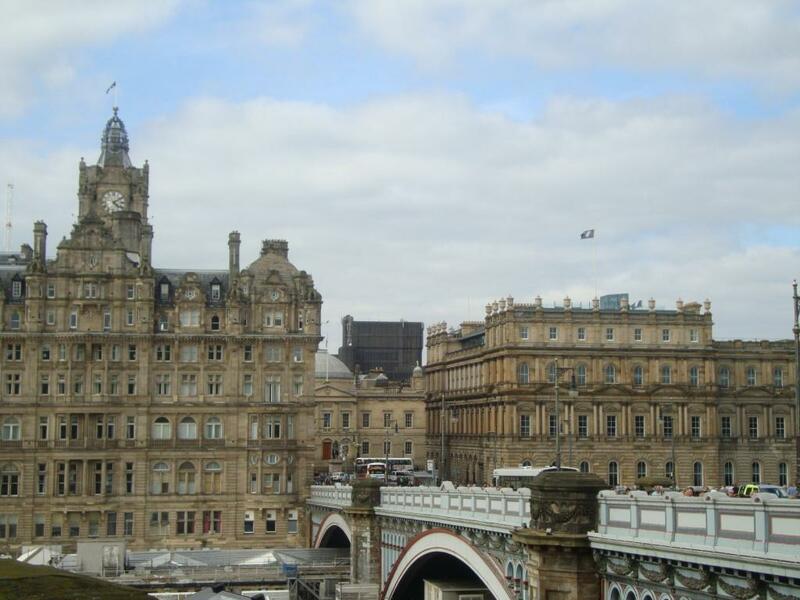 As Tourist in Residence to the Edinburgh Art Festival, Anthony Schrag has designed a bunch of one-off tours that are quite unlike your usual walking tours. 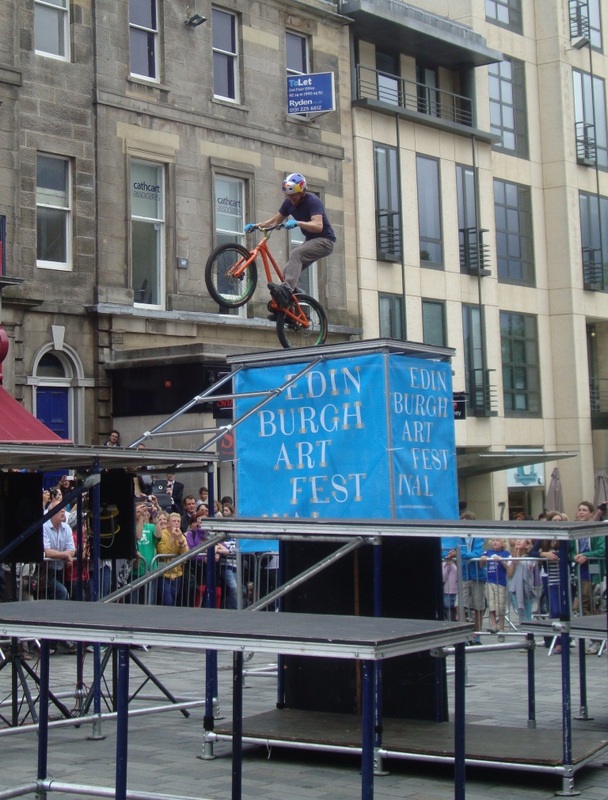 Already he’s run a workshop on parkour/urban climbing and an ‘unsensory tour’ and later this week he’ll be hosting a free-form football match in Rose Street (there are still tickets left! Do it!). The initial description said that the tour would be based on ideas of the ‘golden ratio’ and I was a wee bit wary – sometimes artists + mathematical concepts doesn’t work out so well (at least from a mathematical point of view). But I was charmed by the idea of drawing a golden-ratio spiral onto the map of Edinburgh and going where it led: focusing initially on the new town and how aristocrats returning from their Grand Tours brought back particular ideas of beauty and moving outward into other areas – is brutalist architecture beautiful? What would be the modern equivalent of how a mediaeval person would admire stained glass as an exciting visual experience? I was a little disappointed there was no parkour/urban climbing demo on this walk but we did get to walk down a cobbled street blindfolded (I was more comfortable with this than I expected – I’d normally freak out at sensory deprivation) and climb up the Scotsman steps with mirrors under our noses pretending we were walking on the ceiling (I hope somebody got pictures). 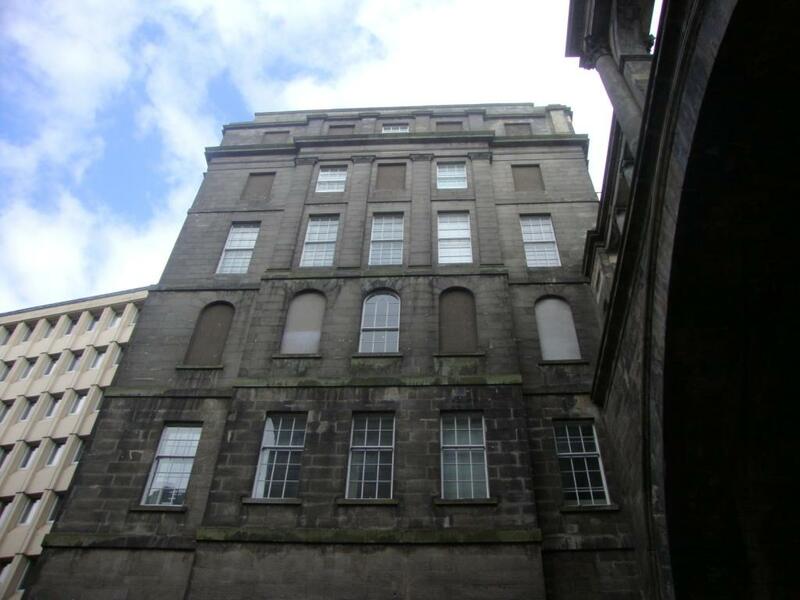 I guess the lasting thing for me will just be noticing some things that I’d probably looked at before but never really seen – crests, gateways, combinations of old and new buildings, window-taxed windows. 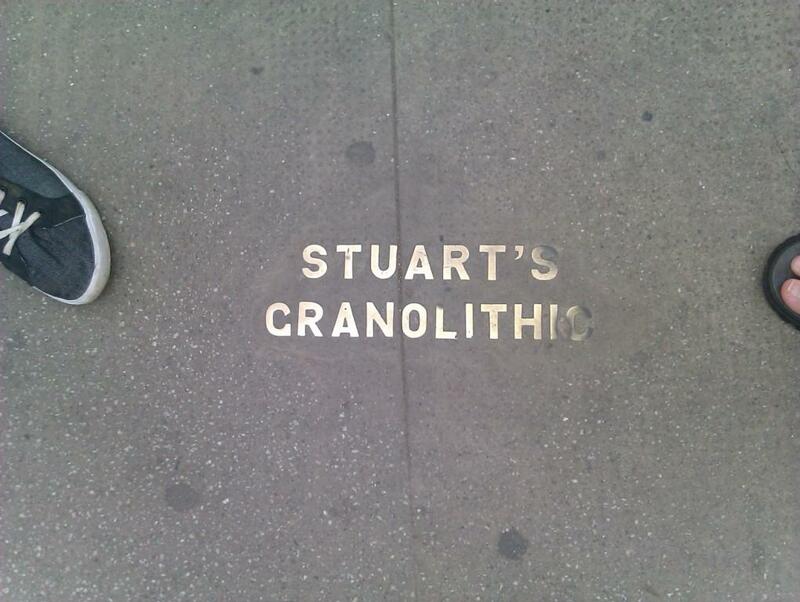 The sign in the pavement of the station that says ‘Stuart’s Granolithic’ (a type of concrete). The way the St James’ centre tower looms over the ‘pretty’ buildings from some angles (I’m sure my brain must just have censored this out previously). Anthony Schrag is fabulously enthusiastic, interesting, a bit quirky and totally rule-breaky in a way that I’m really not (It says ‘Private Property’! Yay, even more reason to go down it!) If you get a chance to go on one of his remaining tours, definitely take it. Upcoming: I’m mostly book-festivalling for Clicket for the next few days. The poetry polaroid map was unveiled in Pulp Fiction last night. It has a bunch of fab poems in it – and I’m glad to discover I wasn’t the only one who made the mistake about the street numbering. It’ll be displayed in Pulp Fiction till Tuesday – do pop in and see it if you get a chance! I am completely unable to remember the title of Harry Baker‘s show in anything like the right order, so having looked it up, I can say it’s Proper Pop-up Purple Paper People (12 noon at the Royal Oak). The poem of the same name is astoundingly tongue-twisterly but unhesitatingly delivered, like all of his work. I quite like downstairs at the Royal Oak – it’s a venue where 12 people doesn’t seem sparse (I’m expecting the numbers to go up now he finally has flyers). Harry works well with an audience and his poems are a sweet reflection on a first year of university – particularly the one about being the only man at pole-dancing soc. The one that absolutely cracked me up was him doing his German presentation as hip-hop. Especially as he totally lied about his family to make the piece rhyme! I’d never thought that lying was allowed in language presentations, it was a revelation! Go to see it for the dinosaur love poem and the German poem. Oh, and the dessert poem. If it’s the bee poem and the maths poem that you’re after (I am kind of obsessed with both of those) his other show is running at 2:30 in Ryan’s Cellar Bar from next week. I spent a good chunk of the afternoon doing a bunch of historical research because of a misapprehension. When I got my poetry polaroid from Inky Fingers, marked ’13. Broughton St’ I thought I had to write about 13 Broughton Street and was quite perturbed when the odd side of Broughton Street turned out to start at number 19! So I went off to Edinburgh Central Library where the lovely librarians helped me out with maps, press cuttings, voters’ rolls and valuation rolls – fantastic! Really interesting. 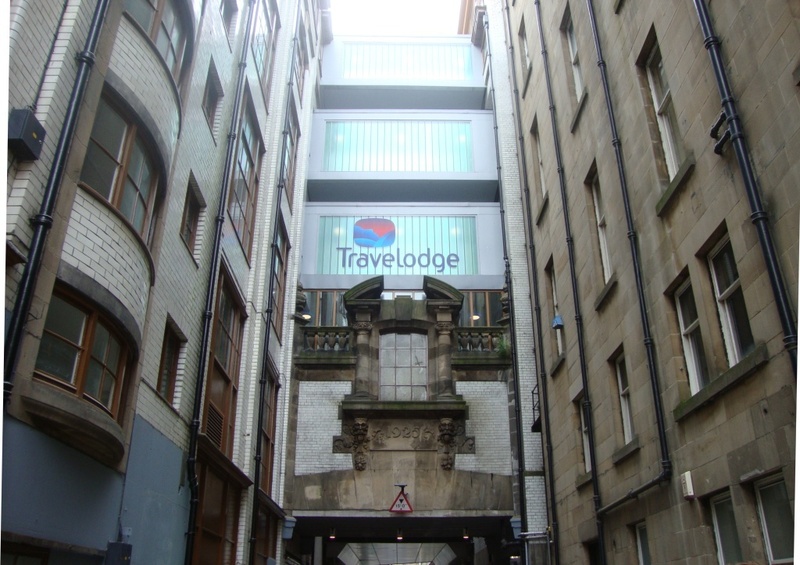 Turned out it had been pulled down in the 1960s during the extended St James development – basically that whole block is under that roundabout. And I learned that they’d originally planned to pull down the Catholic cathedral on the other side of the road and make a new concrete pointy one. Anyway, I then went into Pulp Fiction to write my final piece and discovered it was polaroid number 13, write about Broughton Street. Oops! My literal-mindedness had led me astray again! I had no time to change course, so I used the texts I’d found to make a wee historical account. I have a feeling a more crafted poem about my quest may emerge in the next few weeks. There were some wonderful words in the archive which are very tempting. I shot out of Pulp Fiction to head to the Talbot Rice gallery for another Art Festival Detour, a touching urban short story by Inua Ellams. Having seen so much spoken word recently, it’s a novelty to see someone actually read a story off a page on a lectern, but a pleasure to see it done so fluently and with excellent audience engagement as the story unfolded. Beautifully crafted. I’d never actually been in the Talbot Rice before and it’s an amazing space – I loved what I saw of the Tim Rollins/K.O.S. exhibition as well and I’ll definitely be back to give it a longer look. Upcoming: I’m off walking with the Tourist in Residence today! Very excited about that. From Sunday, I’ll be writing about the book festival for Clicket, plus more of the DanceBase fringe shows.